This project in Smithtown, NY incorporates our client’s wish list of a large patio and seat walls with outdoor furniture, an outdoor fireplace as a focal point, a play set for the kids, a large expansive lawn area, and a natural retaining wall with color plantings. 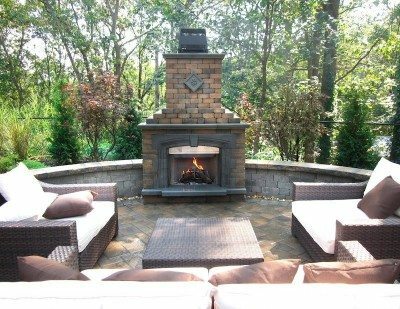 Paver Patio – Cambridge Ledgestone-Toffee/Onyx Paver Patio- Random Pattern with Cambridge Olde English Seat Wall with Outdoor Fireplace. Paver Steps – Cambridge Cast Stone Steps- Bluestone Blend set into staggered New York State Boulder retaining wall.